Hi everyone and welcome. 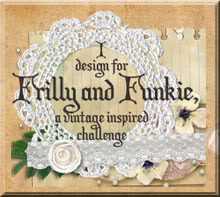 Over at the Frilly and Funkie Challenge blog we are half way through a new challenge, 'Just My Type'. It's my turn to host and, as a trained touch typist I love vintage typewriters. I love the way they look and sound and the font they create. 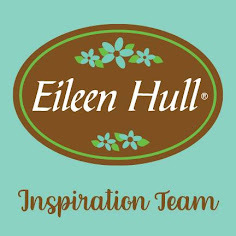 For this challenge create a vintage or shabby chic project and include a typewriter, typewriter keys, typeface. I had fun incorporating some of the new Tim Holtz Halloween releases into the theme to create this Etcetera Tag. There's the new Worn Wallpaper which has been teamed with layers of Distress Paint to recreate the look of an ageing wall, and the new Tangled Webs stamp set, used to add those dramatic heat embossed cobwebs. And don't you just love the fonts on the new Halloween Quote Chips with their bold black backgrounds. Typeface has been included in the background through the use of a stamp from the Documented set and the Design Tape which comes from the Journey collection. I cut a number of gears from sanded Metallic Kraft Stock using Tim Holtz Gear Head Thinlits Die Set and dived into his new Funky Foliage Thinlits Die Set to cut the leaves surrounding the dyed Bouquet Findings flowers. I love to colour those with alcohol ink diluted with a little blending solution and in this case used Stonewashed Alcohol Ink. 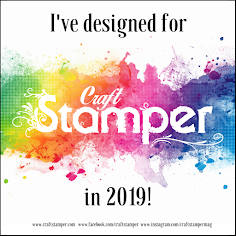 Begin by mounting the stamp onto your Stamp Platform and inserting a piece of Distress Watercolor Cardstock smooth side up. Stamp the main part of the image using Vintage Photo Distress Oxide Ink, masking off the sections containing the words at the top and bottom. Remove any reside ink from the stamp whilst leaving it in place for the next layer. Mist the image with a little water allowing the Distress Oxide Ink to bleed before drying. Re-stamp the image with Black Archival Ink, this time including the words as well as the image. Trim the panel to the required size before adding dots of Glossy Accents onto the typewriter keys to highlight them. I then mounted the panel onto layers of Worn Wallpaper and Metallic Kraft Stock before adding it to the tag. That's it for my animal themed project for the current Frilly and Funkie challenge. My talented team mates have created lots more amazing projects for this challenge so make sure you hop on over and check them out HERE. And remember to link up your own shabby chic or vintage entries featuring typewriters, typewriter keys, typeface to be in with a chance of winning one of the fabulous prizes. So fabulously cool Jenny! I love every bit, and so gorgeous! Talk about details! I can't believe you added Glossy Accents to the typewriter keys! It really makes them pop! Clever you! The rusty stamping effect is so cool and really looks great. And as always, I'm swooning over that background! I always learn something new, and come away inspired whenever I visit your lovely blog. Clever and kind...that's you! Wow, wow, WOOOO! Jenny, your details never disappoint! What a clever way to get the MOST from that wonderful typewriter image! Your background is amazing and as always, your collage is just one delicious layer after another! GORGEOUS! (There just are not enough adjectives!) Hugs! Such an eclectic combination of elements that works perfectly together. Love how you treated the typewriter stamp, especially the with the addition of the glossy accents. You are brilliant!!! Adore! The burst of golden brown over the typewriter adds this golden focal point highlighted with those dots of gloss on the keys. Beautiful design and the pop of the blue mini flowers are so pleasing to the eye! Gorgeous tag!